L. Saufeius was one of the moneyers for the year 152 BC. He is not otherwise known. The gens Saufeia originally came from Praeneste in Italy. 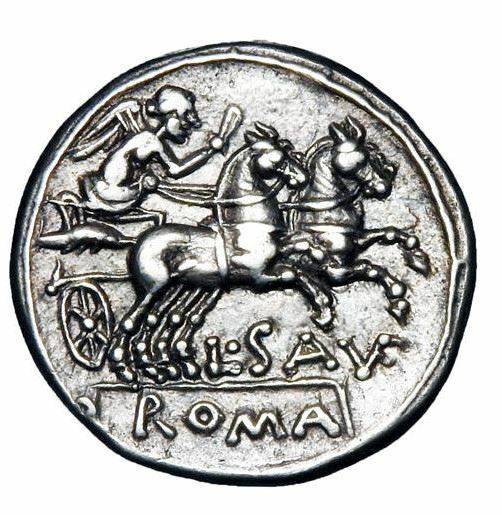 During the latter half of the third century BC a branch of the family settled in Rome, became Roman citizens and held senatorial positions during the Gracchan era. Among the listed officials (praetores, censores, aediles, quaestores) one Lucius Saufeius, an ancestor of the moneyer, was seemingly the first of the gens to have held Roman office.